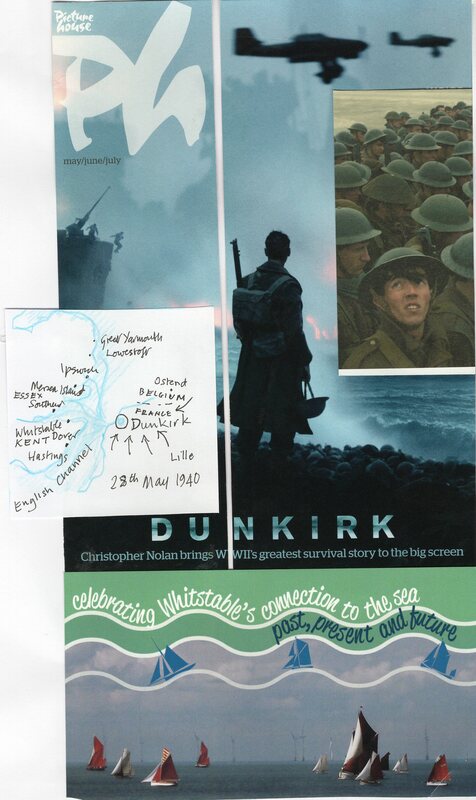 The terrible impact of the Dunkirk Drama as brilliantly portrayed in Christopher Nolan’s astonishing film, contrasted with a more recent two days at the seaside down at Whitstable. There at the Thorling home built into the sandy cliffs at Seasalter, a sense of calm and peace returned. The gathered company of neighbours provided us with merry company after an enjoyable day wandering around Whitstable Harbour Day’s jollies exploring the diverse vessels gathered there for the annual Harbour Match, which hovered just off-shore, becalmed in a tidal battle. The gathered fleet echoed the brave endeavours of the little ships which ventured across the channel’s hazards to save the BEF from a humiliating defeat. The late Robert Thorling would certainly have joined the flotillas of weekend sailors if called upon. His memorable wake was held in an old army barrack but set in the sandy dune just below their prime seaside frontage, with commanding views across the Swale and Thames Estuary. By chance, son Ben was afloat with family sailing from nearby Hollow Shore, while Emma flew in to Southend from an Adriatic cruise in company with another yachting family. Perhaps they would have been called to join the thousands of weekend sailors summoned to the colours. A second viewing of ‘Dunkirk’ was necessary to identify the various craft which included local fishing boats, coasters, spritsail barges ‘et al’, also to remind me of my National Service days clad in prickly, damp khaki uniform and heavy and cumbersome kit, always at the double!! I return to my pen to record the endeavour of a visiting Dutch yacht fighting against a falling tide and failing light to make her upstream mooring. This reflects the determination of small boat owners way back in 1940. A splendid hard-backed book of all those involved appears in a page-by-page account of many craft selected from a card file of 700 little ships: ‘The Little Ships of Dunkirk’ was first published in 1989 by Collectors’ Books. I am proud to own a copy which I will read again with even more respect – Bravo!